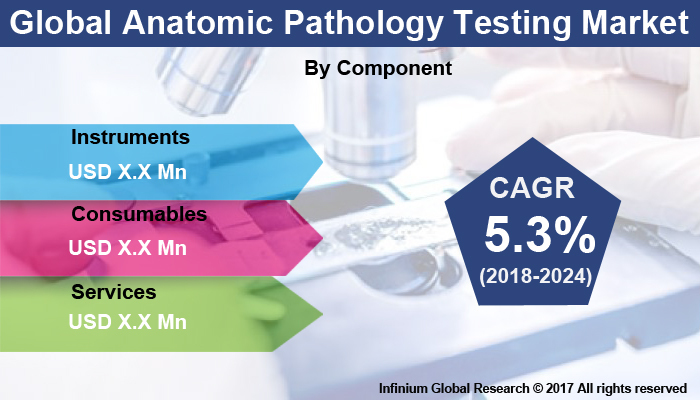 A recent report published by Infinium Global Research on anatomic pathology testing market provides in depth analysis of segments and sub-segments in global as well as regional anatomic pathology testing market. The study also highlights the impact of drivers, restraints and macro indicators on the global and regional anatomic pathology testing market over the short term as well as long term. The report is a comprehensive presentation of trends, forecast and dollar values of global anatomic pathology testing market. According to report the global anatomic pathology testing market is projected to grow at a CAGR of 5.3% over the forecast period of 2018-2024. Anatomical/ Anatomic pathology is a medical sphere that is related with the diagnosis of disease based on the macroscopic, microscopic, biochemical, immunologic and molecular examination of organs and tissues. Anatomic pathology testing deals with diagnosing disease by examining tissues, either through gross pathology or by light microscopy and other advanced techniques. The increasing prevalence of chronic diseases, changing lifestyle, growing aging population, modernization of medical facilities, development of medical science and increasing healthcare expenditure are the major factors driving the growth of this market. Increasing R&D expenditure is driving the adoption of anatomic pathology services in pharmaceutical and biopharmaceutical companies for drug discovery & development applications. On the basis of region, the anatomic pathology market is divided into North America, Europe, Asia, and the Rest of the World (RoW).North America held the largest market share in 2017 on account of increase demand for medical facilities, increasing healthcare spending and government initiatives, rising awareness about the use of anatomic pathology tests among physicians or doctors are some major factors driving the growth of this regional segment. Asia Pacific region is expected to grow at the highest CAGR during the forecast period. The report on global anatomic pathology testing market covers segments such as component, application and region. On the basis of component the global anatomic pathology testing market is categorized into instruments, consumables and services. On the basis of application the global anatomic pathology testing market is categorized into disease diagnosis, drug discovery & development and other applications. On the basis of region the global anatomic pathology testing market is categorized into North America, Europe, Asia Pacific and rest of the world (RoW). The report provides profiles of the companies in the global anatomic pathology testing market such as, Sakura Finetechnical Co., Ltd. (Japan),, Quest Diagnostics Incorporated (U.S.),, Laboratory Corporation of America Holdings (U.S.),, NeoGenomics Laboratories, Inc. (U.S.)., Agilent Technologies (U.S.),, Danaher Corporation (U.S.),, Thermo Fisher Scientific (U.S.),, F. Hoffmann-La Roche AG (Switzerland),, Abbott Diagnostics and Advanced Cell Diagnostics. The report provides deep insights on demand forecasts, market trends and micro and macro indicators. In addition, this report provides insights on the factors that are driving and restraining the global anatomic pathology testing market. Moreover, IGR-Growth Matrix analysis given in the report brings an insight on the investment areas that existing or new market players can consider. The report provides insights into the market using analytical tools such as Porter's five forces analysis and DRO analysis of anatomic pathology testing market. Moreover, the study highlights current market trends and provides forecast from 2018-2024. We also have highlighted future trends in the anatomic pathology testing market that will impact the demand during the forecast period. Moreover, the competitive analysis given in each regional market brings an insight on the market share of the leading players. This report will help manufacturers, suppliers and distributors of the anatomic pathology testing market to understand the present and future trends in this market and formulate their strategies accordingly.